United Methodist Women's largest fundraiser of the year is coming! 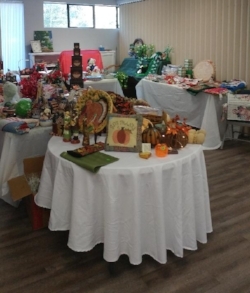 Always the first Saturday of October, our 10th Annual Holiday Fair is a unique experience in fun and fellowship starting at 9:00 a.m. on Oct. 7. Plan to bring a friend, and get your Christmas shopping done early! Café with Breakfast Tacos and Pulled Pork for lunch, Silent Auction, many local Arts & Crafts Vendors, Gently Used Treasures, Home & Holiday Boutique, Card Shop and Pantry (which always sells out). Proceeds benefit Women's Missions, and the biggest blessings are opening our arms and hearts to our neighborhood, offering affordable shopping, and spending time in service as one church family. Each year, God provides new opportunities to share the good news of His love! Volunteers and donors needed and welcome! Contact Chair Mary Haynie: 210.651.3084. Vendor Spaces are now available so get them before they sell out!!! For details, please call or write Daphne Ortega, at 210.324.2487 (daphnegortega@gmail.com). This year, regular spaces rent for $35 and include a table with 2 chairs. These spaces are outside on the blacktop (you can bring a canopy), or under an overhang to give protection from inclement weather. If you prefer a larger space, you can choose a lawn space, also with a provided table and 2 chairs (where you can put up a canopy.) The lawn spaces rent for $50. If you wish to bring your own table, regular spaces are $25 and lawn spaces are $35. Spaces for each additional table you bring are $15. We advertise local, regional and social media, a banner across Pat Booker Road, as well as word of mouth through our congregation, accredited preschool, friends and families. The list of highlighted vendors on the enclosed flyer is a sample; we update this throughout our publicity season as vendor reservations are made. Our silent auction and popular shops by volunteer church members is a specific draw and provide a unique character to our event. The proceeds of the Fair are used to support our ongoing mission commitments and charitable projects in the neighborhood, local area and across the world. In addition, our many dedicated volunteers work hard to make our Fair an enjoyable event for shoppers and Vendors. The fair truly becomes a special day of connection and fellowship for folks from our church neighborhood and all across the San Antonio area. Your purchase of Vendor Space will support your business and our mission efforts. Registration information is enclosed. Please share with your fellow vendors, friends and family and send your application to reserve your space! Thank you for your time and careful consideration for this very worthwhile event.